As the world’s media hails Burma’s first elections since 1990 and the country’s ‘democratic transition’ from military rule, Guy Horton warns against the delusional thinking that underlies these optimistic narratives. The reality is one of murder, genocide and systematic discrimination – in which Aung San Suu Kyi herself is complicit through her silence. I was listening to the BBC World Service. Over the airwaves I could hear the Secretary General of the United Nations warmly welcoming the ceasefire. A few minutes later I heard a prolonged bombardment of mortar shells. As Burma is gripped in election frenzy, one could be forgiven for believing a genuine democratic transition is taking place. This, sadly, is very far from the truth, however. Rohingya Genocide. Artwork by AK Rockefeller via Flickr (CC BY-SA). In short, perpetrator and victims of doublethink can believe their own delusions. This appears to have happened in Burma since 2010: people generally believe a genuine political transition is taking place. This is untenable and illogical in face of the facts, but that is the point of doublethink: to render meaning meaningless. Burma doublethink and consequent delusion are both wrong. Ongoing repression and destruction inflicted within the context of the totalitarian 2008 Constitution is the truth. Basic facts speaks for themselves. Since the ‘democratic transition’ and the ‘ceasefire’ talks began, well over 300,000 ethnic peoples, including, amongst others, Kachin, Kokang, Shan and Rohingya, have been terrorised out of their homes and, if one includes the de facto forced concentration of the Rohingya in north Rakhine State, close to one and a half million people have been systematically persecuted. This is not peace. This is not a democratic transition. It is systematic violence and re-consolidation of Bamar military power. Aung San Suu Kyi and the NLD has largely maintained a complicit silence on this and the vacuum has been filled with rabid Buddhist racism. Let’s begin with a specific example of dealing with the contradictions of doublethink from my own experience. The events took pace in January 2013 in Ma Ja Yang, Kachin State in northern Burma about 7.30 on a misty, bird song filled morning. I was listening to the BBC World Service. Over the airwaves I could hear the Secretary General of the United Nations warmly welcoming the ceasefire. A few minutes later I heard a prolonged bombardment of mortar shells. Throughout Kachin State thousands of Burmese troops massed in frontal attacks drawn from all over Burma. Helicopter gunships and fighter bombers had flown over the town a few days earlier resulting in the deaths of children. Everybody knew this was happening. Film footage had been shown on world media of attack helicopters, fighter bombers and intense trench warfare. The BBC knew because they were in nearby Lai Za. Over the State as a whole a 120,000 Kachin civilians have been terrorised out of their homes. A man wept next to me after describing his daughter bayoneted to death in front of him. An eight year old boy looked at me with stone eyes after watching his mother shot in front of him. These realities could not, however, be allowed to disturb the Secretary General’s Ceasefire narrative. Thus the Secretary General of the United Nations duly welcomed the ceasefire even as the 120 mm mortar bombs came crashing down. Nothing, including the reports from his own UN appointed Special Rapporteurs for Human Rights implicitly alleging Crimes against humanity for years, could, or can be, allowed to disturb the dominant narrative of ‘peace’ and ‘democratic transition’. Nothing, not even an extra one and a half million persecuted people in Burma as a whole, can be allowed to disturb the delusion of doublethink. What can have enabled sustained misrepresentation of the truth for so long? The usual suspects: passive complicity, (knowing the truth but failing to do anything about it even when you are in a position to do so), complacency, ignorance, self interest, language deficits, knowing which slice of bread funders are likely to butter, the myopia of the Yangon bubble, cannot, however, adequately explain a delusion of this magnitude being perpetuated for so long, so persuasively endorsed by ‘experts’, and so passively recycled by the media. Something deeper than hypocrisy is at work. It is likely the perpetrators believe ‘the great delusion’. Let us take another obvious example of doublethink, this time from the the media. Timemagazine carried a front page article praising Burma’s democratic transition titled ‘Burma unbound‘, involving, amongst other things, the usual downplaying and disregarding of the hundreds of thousands of victims of State sponsored violence; the intimidation and coercion inflicted during the 2010 election and the bogus nature of the 2008 Constitution Referendum reslult. Later in the same year it carried, again on its front cover, a ‘contradictory’ article on Ashin Wirathu: “The face of Buddhist terror“. In terms of bifocal doublethink both are equally ‘correct’ but how can they be? Let’s think about the significance of Wirathu before analysing this article. He is not just a hate filled individual ‘monk’. He speaks for much of the Bamar community and his ideas on race, religion and marriage are now the ‘law’ of the land. He has become, in the moral vacuum left by Aung San Suu Kyi and the NLD, the unacknowledged legislator of Myanmar. In condemning Wirathu, Time was condemning much of the racist and religious prejudices close to the heart of the military controlled regime. So what is Time‘s ‘Burma’? The unrealistic optimism of “Burma unbound”, or the grim“Face of Buddhist terror?” How and why did the West’s leading news magazine depict two ‘contradictory realities’ within months of each other and present both as equally valid Truths? Why, in the earlier Kachin State example, did the Secretary General of the United Nations endorse the ‘peace process’ when he knew his own UN appointed Special Rapporteurs for Human Rights have implicitly alleged continual ‘crimes against humanity’ for years? How is any ‘peace process’ compatible with systematic, military assaults on ethnic villagers and land grabs? Let’s take another example: the persecution of the Rohingya and the level of intentionality underlying it. The New York Times limited responsibility to government “complacency”, a level below even criminal negligence; the recent Yale report identified “sound evidence of genocide”, i.e. an intention to destroy a people in whole or in part. These are both serious respected institutions of American public life. How can the destruction of the Rohingya be both the result of trivial ‘complacency’ and the intent to commit genocide? Doublethink would have us believe both contradictory realities are true. Doublethink is additionally alarming because it functions at the highest levels. The EU Commissioner for External Affairs reportedly described the Government’s early response to the violence instigated against the Rohingya as “appropriate”; the former Prime Minister of Norway, called their systematic persecution “an internal Myanmar matter”. It is not, however, just the reality of doublethink which is so alarming: it is its longevity. This is clear from reading the UN Special Rapporteur for Human Rights reports and General Assembly Resolutions since 1992. In addition, Orwell pointed out, above all, that doublethink requires its perpetrators to forget. the drafting process of the Constitution was illegitimate. It was drawn up in total secrecy. the implementation process was illegitimate. It was inflicted through fear and intimidation. the Constitution cannot realistically be amended. the 2010 election was fraudulent and characterised by fear and intimidation. the ‘laws’ passed by the resulting illegitimate parliament consequently have no legitimacy. 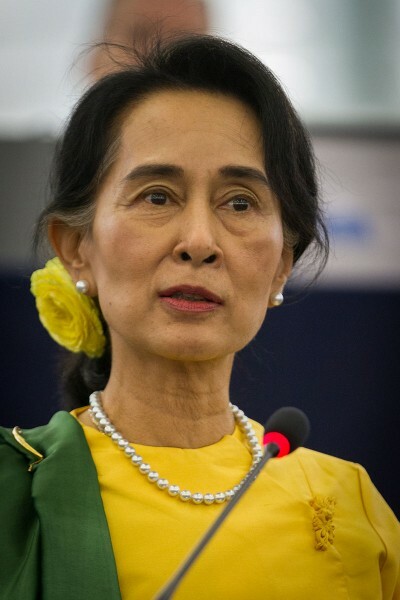 the election of Aung San Suu Kyi in 2010 was not ‘a Mandela moment’, but consolidated the delusion of democratic transition in the wilfully gullible international community. this 2015 current election is neither free nor fair because, amongst other things, 25% of the seats are reserved for the military. the speaker of the lower house was recently removed in a nocturnal ‘palace coup’. the ‘peace process’ has masked sustained military assaults against the Kachin, Shan, Kokang and others and systematic persecution of the Rohingya and Moslems in general. the ‘peace process’ cannot deliver genuine federalism nor, therefore, a just and lasting peace. in many ceasefire areas, land grabs and gangster capitalism replace ethnic cleansing, a process misrepresented as ‘development’. the Burma military recently twice ‘succeeded’ in bombing the world’s emerging super power, China, killing Chinese nationals. the census result came in about 9 million people fewer than predicted over a period when UN Special Rapporteurs alleged “crimes against humanity” and “elements of genocide” may have been inflicted. about 20% of the electorate have reportedly been excluded from this election. In conclusion, we should remain very sceptical about this election and not repeat the absurd euphoria that accompanied Aung San Suu Kyi’s release and subsequent by election victory. If, as seems probable, her party becomes the largest in the Parliament, it is likely to be the prisoner of the 2008 Constitution and have to kow tow to Buddhist nationalism and fundamentalism. The deputy leader of the NLD reportedly prostrated himself before Wirathu recently. Moreover, her personal actions since her release raise questions as to what she really believes. She sided with the military on the Lepadaung mine confrontation, shared the podium with the generals just after their massive attack on the Kachin, and has disregarded allegations of crimes against humanity and genocide inflicted on ethnic peoples in a manner which appears to go beyond the compromises required of realpolitik. If her party triumphs it is not so much whether she could bring the army under the rule of law, but if she has the political will to do so. When President Obama came to Office he understandably, but naively, offered the Burma military an outstretched hand. The response has been a colossal sleight of hand. On that morning in January 2013 I had to make a ‘hard choice’ between ‘two mutually contradictory beliefs’: the Secretary General’s Neverland which I wanted to believe, or the reality of falling mortar bombs and the anguish of victims next me which I had to believe. I chose the latter. I chose the truth. I chose not to collude with doublethink and promote delusion. I chose to shoot both those elephants in the room stone dead. And I chose never to forget. Guy Horton has worked on Burma and its border areas since 1998. His 2005 report, ‘Dying Alive‘ and supporting video footage, received worldwide coverage and contributed to the submission of Burma to the UN Security Council in January 2007. As a result of the report, the UN Committee on the Prevention of Genocide carried out an investigation and placed Burma / Myanmar on the Genocide Watch list. Since 2005 Guy Horton has focussed on establishing a coalition of governments, funders, institutions and leading international lawyers with the aim of getting the violations investigated and analysed so that impunity can be addressed. He is currently a researcher at the School of Oriental and African Studies, University of London. He was short-listed for the post of UN Special Rapporteur for Human Rights in Myanmar 2014.